Hubertus Brockhaus hails from Germany and is an international volunteer for the C4C project under Challenges Foundation. 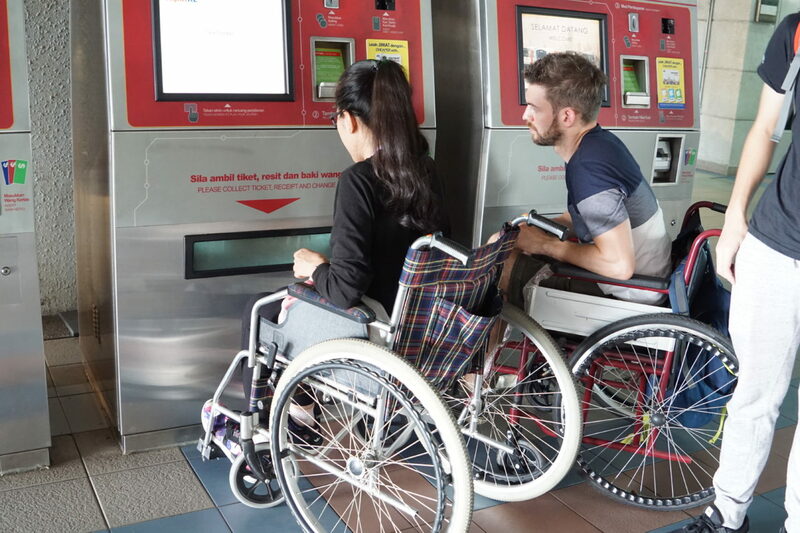 He shares his experience travelling on Malaysia’s public transport system in a wheelchair. Meeting was at 10 am at the LRT station Taman Jaya. After a short briefing Misa, Phalla and myself sat down in the three free wheelchairs. I noticed it quickly that my freedom of movement was severely restricted. Just a short walk upstairs to buy something to drink was not possible anymore. Now I have to wait for using the elevator, driving to the shop, buying a drink and using the elevator again to come down. Normally I would need two minutes to buy a drink and come back down. But with the wheelchair I would need five or more minutes for the same procedure. In general, I noticed that everything in a wheelchair takes much longer. Not only that you are just slower in a wheelchair, you have to wait a long time for the elevator, you need a lot of time to find the next ramp or you have to make a u turn because there are just stairs and no ramps in front of you. We sat in the LRT from Taman Jaya to the next station Bangsar. The biggest obstacle during entering the train was the gap between the platform and train. The front wheels got stuck and without help I wouldn’t have been able to get in. After leaving the LRT with all seven wheelchairs we have to drive to the next elevator. We only reached the elevator by using a steep ramp. With the elevator we drove to the first floor. The buttons for the different floors were placed disabled friendly and we could use them easily. But we needed help keeping the doors open. They closed very quickly. Once we arrived at the bottom, we went out and looked for the ramp with which we could get onto the sidewalk. Once down we went back into the building to take a look for the toilets. Apart from the fact that there was no soap and no toilet paper, the toilets were disabled friendly. I had no problem to drive with my wheelchair under the sink to wash my hands. After the scouting tour at the station Bangsar we took the LRT for driving to KL centre. Same problem by entering the train as the first time. The front wheels got stuck again. 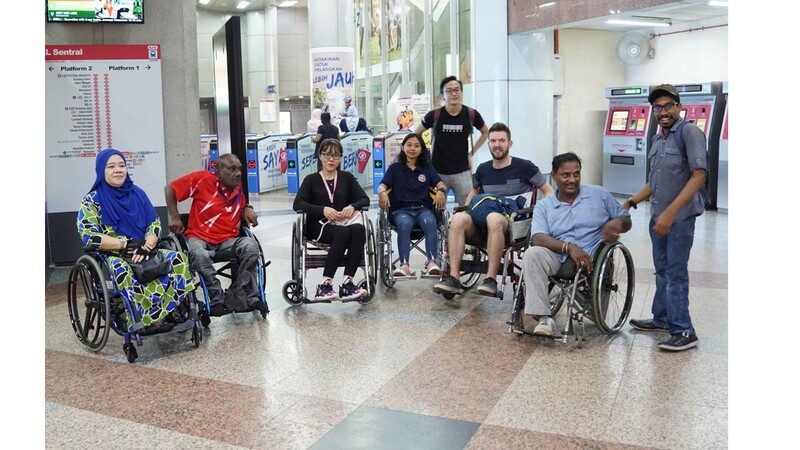 After arriving in KL centre we went with all seven wheelchairs and our 3 guides to the next mall for having lunch. First problem was finding a free table. Because that everything was crowded with tables, chairs and people it was hard to find a free table with a wheelchair. Sitting with everybody at one table was impossible. So we had to split up and have to eat at different tables. After finding a table, there was coming the next problem. Finding food and take it with your wheelchair back to the table. After a short search, because you have the feeling that you are rolling into people’s path, I quickly decided on a meal. A big question I asked myself was, how can I take the dish back to the table? Luckily the Malaysians are a friendly race and open minded. So one staff from the restaurant catches up my dish and was following me back to my table. Really cool from this guy. I’m thinking that no staff in Germany would do that. After the lunch we went back down to the LRT station from KL centre to drive to Muzium Negara. Once there, the whole station was checked for disability access. All toilets, all elevators, all the ramps and also the telephone systems where checked. After a successful check we went back to Taman Jaya. At least the whole station was checked if it was disability friendly as well. At 3 pm everything was over and I was glad to stand up out of the wheelchair and was able to walk again. After five hours in a wheelchair my body was not feeling good. And all the other guys have to sit in a wheelchair 24 hours 7 days a week. My biggest respect for them holding out. Especially in the non-disabled friendly city KL. For me the day was a complete success, because I was able to get my own picture of the situation of disabled people in wheelchairs.